Renewable Energy uses energy resources and technologies that are “clean” or “green” because they produce few if any pollutants. Many people use the terms “Alternative Energy”, “Renewable Energy” and even “Green Energy” together in the same sentence when taking about energy sources as though they all mean the same thing, but they are not the same. Each term means something different when talking about energy systems. So what does renewable energy mean. Some say that alternative energy comprises everything that is not based on fossil fuel consumption. While these may be alternative energy sources compared to conventional fossil fuels, alternative energy in its broadest sense, is any type of energy that replaces another, so we can correctly say that coal energy is an alternative energy source compared to crude oil or natural gas but as we now know, coal is a fossil fuel and burning it is bad for the environment. Even nuclear energy was once considered to be an “alternative” to conventional fossil fuels, and was thus called an alternative energy source. Renewable Energy on the other hand uses renewable energy sources that are continually replenished by Mother nature producing a usable energy that can not be used up faster that it is consumed. These energy sources created mainly by the Sun shinning on the Earth are converted into different forms, such as: solar radiation to wind or water based energy which is distributed over the Earth and atmosphere, the Earth’s geothermal heat, and plants in the form of biomass. Renewable energy technologies turn these fuels into usable forms of energy, most often electricity, but also heat, chemicals, or mechanical power. So what are renewable resources. This is the original renewable energy source as the sun gives us heat and light. There are two types of solar energy: “Passive” and “Active”. The first simply involves making use of the position, intensity and duration of the suns rays throughout the day to best advantage, using it to heat our homes or induce an air flow by convection from one room to another, without the use of extra technology beyond what is needed to store the energy. The second type involves using mechanical and electrical technology such as photovoltaic solar panels or solar thermal panels to capture, convert and store the suns energy either in batteries or hot water tanks for later use. Active solar hot water systems use pumps to move the heated water around. There are many types of solar power and renewable energy systems available for harnessing the suns power in the home. The force of the wind has been used as a renewable energy source for many hundreds of years to power sailing ships that sail the oceans and windmills that grind the corn. These days however, wind power involves not one or two windmills dedicated to grinding wheat and flour, but many wind turbines arranged to capture large amount of power at once converting it into electricity and feeding it into the utility grid. Thus windmills transform wind energy into electricity. These large wind turbines are amassed together on a hill side or offshore in the sea to exploit the kinetic energy of the wind. These vast collections of wind turbines together are known as “wind farms” and are becoming an increasingly common part of the countryside. Wind energy is a clean and renewable technology that does not release pollutants, emissions or by-products into the atmosphere during operation since there are no chemical processes involved in its electrical generation. Hydro Energy is another renewable energy resource in which the energy is derived from the power of moving water. The energy from the Sun heats large masses of water such as the sea, oceans and lakes, turning it into water vapour which rises forming clouds high in the sky. The cold air above the clouds condenses this water vapour which then falls back to Earth as rain or snow in the hills and mountains. Then hydro energy uses renewable energy sources. Hydro Energy is a clean, green technology which produces no pollution and part of the beauty of hydro energy lies in its simplicity. Rivers and streams generate currents of water because the water in them is moving downhill, even if only slightly, flowing downwards by the pull of gravity. This water contains large amounts of kinetic energy that can be extracted and used to spin a turbine or waterwheel (mechanical energy), which drives a generator (electrical energy). Even a small stream can produce enough kinetic energy to turn a wheel. Biomass and Bioenergy are the terms used for any kind of non-fossil fuel material that is classified as being organic, biological or made of plant matter, and which can be converted into a usable energy source. Biomass is considered to be a vital resource that we can use on the Earth to the point of being called a “Bio-renewable Resource”. Biomass energy production involves converting biological material or wastes into substances that can be used as fuel for heating, transportation or power generation. Biomass has many advantages as a bioenergy fuel, reducing landfill wastes and emissions. Biomass uses a variety of different crops supporting farmers, producing new cleaner and renewable alternatives to crude oil and conventional fossil fuels. But biomass also has its disadvantages, biomass is only renewable as long as it is not consumed faster than it can be replaced, solid biomass fuels have a much lower energy content than fossil fuels, fossil fuels are consumed to produce bioenergy fuels and large amounts of land are required to grow the trees and crops decreasing the amount of land available for agriculture and food production. “Biomass” and “Bioenergy” are available in the there basic forms of a solid, a liquid or a gas. The planets oceans and seas offer many promising sources of power and all renewable energy sources at that. Tidal power involves capturing the kinetic energy of the incoming and outgoing tides, as well as capturing the potential energy trapped in the local differences between high tide and low tide. Tides are caused by the gravitational forces of the moon and the sun, which vary throughout the year due to their elliptical orbits and thus cause the oceans to rise and fall in a continuous and predictable cycle. This rise and fall of the oceans water results in coastal areas having two high tides and two low tides within slightly more than 24 hours. Then we can use tides as an alternative energy source. Similarly, there is energy in the continuous wave action in the oceans. As the wind passes over the surface of the oceans, a portion of the winds kinetic energy is transferred to the water below, generating waves. Wave power converts the periodic up-and-down movement of the oceans waves into electricity by placing equipment on the surface of the oceans that captures the energy produced by the wave movement and converts this mechanical energy into electrical power. The Earth itself offers many promising sources of power but as we have seen there is a difference between alternative energy, and renewable energy. Alternative energy refers to any form of energy which is an alternative to the traditional fossil fuels of oil, natural gas and coal. Renewable energy are the forms of alternative energy that are renewed by the natural processes of the Earth, such as sunlight from the sun or wind from the air, and so are environmentally friendly. Renewable Energy Sources are about sustainability, they are a clean, inexhaustible and locally available energy source that maintains a balance between the energy being consumed and the new potential energy sources being created allowing for local energy independence. Successful technology deployment in emerging energy sectors such as renewable electricity depends on sustained government policies, at both the project and the program level, and continued progress requires stable and orderly government participation. As with other energy resources, the material deployment of renewable electricity will necessitate large and ongoing infusions of capital. This article has covered a amazing topic.For a better and sustainable future renewable energy is very important and many people are using it whether it is for commercial purpose or for residential.Very informative article.I am glad that I came across such article. This is the original renewable energy source as the sun gives us heat and light. There are two types of solar energy: Passive and Active. There are many types of solar power and renewable energy systems available for harnessing the suns power in the home. 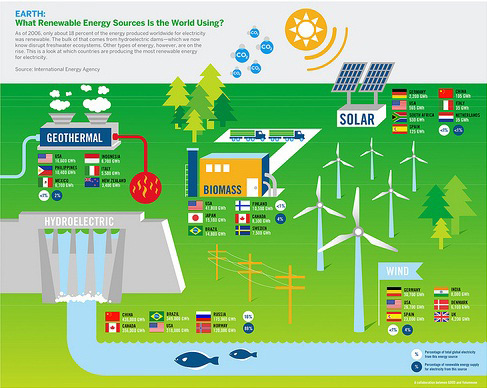 The world is moving more and more towards renewable energy sources, so it helps to know which kinds are available. I particularly like that the article brings up some of the lesser known ones such as biomass. After all, biomass fuel can provide a lot of energy for places with a lot of waste, so it can be good for certain areas. The amount of energy available is inormus and we should strive for utilising as much as possible. Even though it would be very very negligibale.Tremandus potential in research & development & utilisation of Solar Energy.In addition to bulk utilisation of sloar energy ,If every individual is well motivated to use solar energy in all the aplication It would be great . Hello, Renewable energy sources includes the natural sources such as sunlight, wind, rain, tides, geothermal heat, biomass sources such as energy crops. Fuels such as coal, oil and natural gas are non-renewable sources of energy. Bio gas from starch waste and farmyard waste for agricultural and dairy farms and LNG, bio-diesel and landfill gas for industrial purpose are viable alternative sources of energy. One of the most important benefits of renewable energy is the fact that it’s non-polluting. And of course as the name tells us it is renewable and does not use resources that can never be replaced. Renewable energy has a much lower environmental impact than conventional sources of energy. But there are other advantages to using renewable sources of energy. The benefits of renewable energy extend to stimulating the economy and creating job opportunities. The money that is invested in renewable energy is typically spent on materials and staff that build and maintain equipment instead of importing energy.These are the benefits.